The best way to keep your toes warm in cold weather during outdoor activities is to get yourself some air-activated toe warmers that you insert into your shoes or boots. These types of heating products use the same sort of heat reaction process to create heat as the super popular disposable hand heating products. The great thing about toe warmers is that they made for wearing in shoes or boots. So not only are they more comfortable than just putting products intended for your hands into your footwear, but they also have a thin rounded shape with an adhesive backing, so they don’t slip around in your footwear. They can provide warmth to your feet for 6 to 8 hours, making them great for a day out cycling, skiing, hunting, or any outdoor activity when the weather is chilly. In this post, we recommend some of the best products on the market and review everything you need to know to help find the best toe warmers for you. Grabber is one of the most popular brands that sell these types of warming products. They are an air-activated, non-toxic heat source that uses all natural ingredients to help keep your toes warm for 6 hours or more. Each toe warmer is 3″ x 4″ with a thin rounded shape and adhesive backing that stick to the outside of your sock, either under or over your foot. They are designed for use in boots and shoes where there isn’t a lot of oxygen. The average temperature of the warmers is 100 F/38 C, and they can go up to 107 F/42 C. Grabber designs are pre-mixed, so you don’t need to shake them. 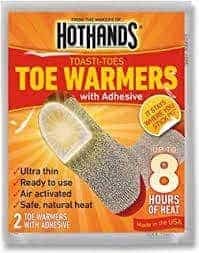 HotHands Warmers are made by the same corporation that makes the Grabber Toe Warmers that are listed above. Both products are very similar (air activated, very thin, single use) with the main difference being the duration of time that the warmer will last. The Grabber Designs will last for around 6 hours, while the Hothands can last up to 8 hours. The recommended uses for Hothands are for outdoor sports, hunting, fishing, tailgating, walking, shopping, or commuting to work. They are very thin, so you will hardly feel them in your shoes, you should only feel the heat. They are made in the USA. Little Hotties are the same kind of product as the two listed above. They are safe, natural, and odorless, and you can use them for all sorts of outdoor activities. They last for approximately 5 hours and are a little thicker than the ultra-thin Hothands or Grabber warmers, so you probably won’t want to wear them with any footwear that doesn’t have a bit of extra space. A lot of people like the Little Hotties for winter sports like skiing and snowboarding because they can get to a substantial heat level and then maintain the heat for the full 5 hours or a little longer. 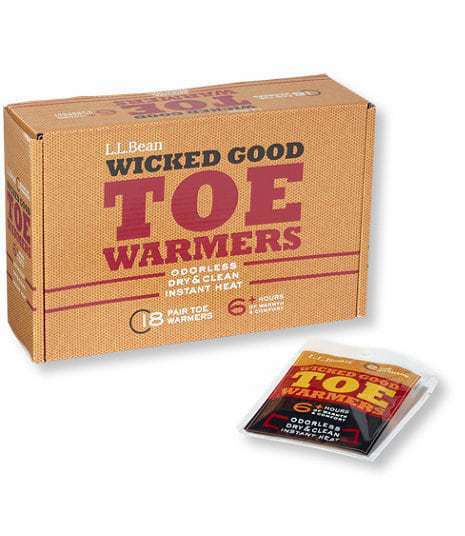 Another option is these L.L Bean Wicked Good Toe Warmers. They last for 6+ hours and come in a pack of 18 pairs for around $30. They are made of all-natural and nontoxic ingredients and the heat they can produce ranges from 100° and 107°F. 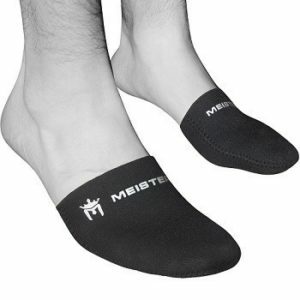 If you like the idea of a toe warmer, but would prefer to have a product that you can reuse, have a look at these Meister Booties. They are designed for biking, running, walking, and hiking on cold days. They are relatively inexpensive and come as a one-size-fits-all. The thickness and the sizing may not be that great for some customers. If you have bigger feet or your feet sweat a lot, then they probably aren’t the best option. But if you want a cheap, reusable way to keep your feet warm, they are worth considering. You could also try Heat Factory Adhesive Toe Warmers or YakTrax Toe Warmers. You can find them at places like Walmart or REI. They don’t tend to have as glowing reviews as the Hothands or Grabbers products, but all of the air activated products essentially work in the same way using the same types of ingredients. So there isn’t a massive difference between the different products, other than thickness and time that they stay activated. When the ingredients (usually an iron powder, water, salt, activated charcoal, and vermiculite) in the air activated toe warmers are exposed to air, they react to produce heat. It takes from 10 to 20 minutes for the product to heat up. Expiry date: Disposable warmers come with expiry dates. The expiry date can be anywhere from approximately 2-4 years from purchase (this may vary). If you are considering buying large quantities, you may want to keep the expiry date in mind and confirm with the seller what the expiry date is. Safety: None of the air activated products are designed to be worn directly on the skin. It is especially important that they not be used with individuals who have circulation issues or anyone unable to feel the heat, as they can get very hot. They are also not for use on infants. 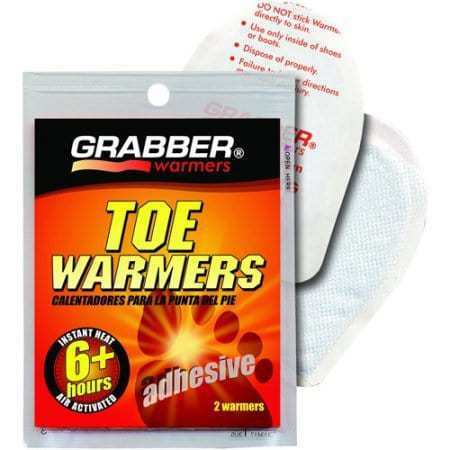 Different types of warmers: You are probably already aware that you can buy a lot of different types of hand warmers, but many people don’t realize that similar products are available specifically for the toes and the entire foot. You can also buy rectangularly shaped body options that you can place where you may need it on different parts of your body. Some individuals use products designed for the hand in their boots or shoes, but this isn’t generally recommended because they are designed for different types of air-exposure levels. The toe and foot designs are made to work in the lowest air-flow environment, so if you use the hand warmers in your boots, they may not get the amount of oxygen they need to warm up properly. Also, the toe designs have an adhesive surface so you stick them either under or over your sock and they won’t move around. If you put hand warming styles into your boots, it might get very uncomfortable, especially if you are walking around a lot. How to Use: It is essential that you don’t use more than more product per foot. If you feel that it isn’t enough coverage, then look at foot warmers or heated insoles. Sizing: Toe warmers are usually one-size-fits-all. One-size-fits-all isn’t the best for many different types of products, but unless your feet are very big or very small, you shouldn’t have a problem. Reusing Air Activated Disposable products: Unfortunately, you cannot reuse these types of products because once the product is opened and exposed to air, the heat reaction begins. The heat won’t last much beyond when the reaction stops, even if the warmer doesn’t get any air. Pricing: The price of the air activated products vary quite a bit depending on the number of pairs you buy at once. There is a whole range of packaging sizes options. As a rough guide, you can probably expect to pay somewhere around $1 per pair if you are buying ten pairs or less. As you increase the number of pairs in a package, the price should go down a bit. Water: If you need a product that will work to keep your feet warm in the water, don’t try the air activated products, instead look at the Meister Thermal Neoprene Booties. You can use them in ice baths as well as other times your feet are in the water. Temperature range: Generally the temperature range you get from these types of products is between 100° and 107°F or 38 C to 42 C. They can take around 10 to 20 minutes to warm up after first being exposed to the air. If you find your warmers aren’t heating up, you may need to leave them outside of your shoes or boots for a few minutes. It will allow them to get enough oxygen once they are removed from the packaging to start the oxidation heat generating process. Arthritis: Toe warmers are safe to use if you have arthritis in your feet. They may help with pain, although there are no specific claims of pain relief from any of the manufacturers. Raynaud’s Disease: Toe warmers can be very useful to help keep your feet warm if you have Raynaud’s disease. Check with your doctor before using. 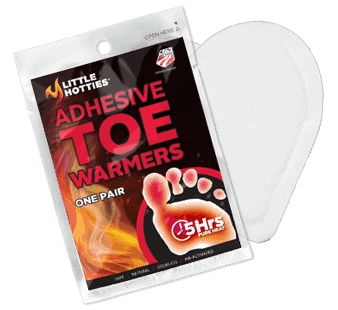 Toes vs. Full Foot – The toe warmers are just intended for those people who have cold toes. If you find that your entire foot gets cold, you should probably look at full foot options. They are a little bit more expensive, but they will give you more coverage and more heat. Environmental Impact– Air activated warmers are made from natural ingredients (iron powder, water, salt, activated charcoal, and vermiculite) and are considered safe for the environment. You dispose of them by putting them in the regular garbage. To help you keep your feet warm during winter activities, it is well worth trying out some of the different toe warmers that are available. They are easy to insert into your boots or shoes, are safe to use, and can make a massive difference to your comfort level when doing outdoor activities.